Jobu checks back in with the Yankees and the big reason they’re still somehow in contention for the Wild Card, Alfonso Soriano. 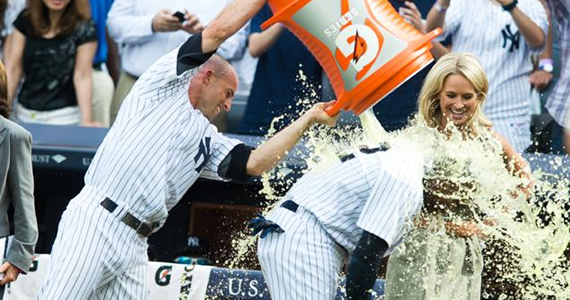 I’m sure many of you have noticed my lack of writing about the Yankees. While a lot of it has to do with the fact that I’ve been editing and writing more varied content so as not to become a one trick pony, my lack of writing about my favorite baseball team is mostly a conscious decision designed not to jinx the good baseball they have been playing. Much like Jerry’s Karma piece from the other day, I too will be tempting fate here by writing about the Bombers. As much as I don’t want to ruin anything, I have to talk about how good Alfonso Soriano has been since the Yankees traded for him. Let’s first mention the fact that Yankees GM Brian Cashman was basically forced into making this deal by Hal and/or Hank Steinbrenner. He did not want to make the move. He thought Soriano was probably too old, too overpaid and not quite worth minor leaguer Corey Black, whom the Yankees sent over to the Cubs for Soriano in July. Not that anyone could have predicted Soriano would be as good as he’s been, but he’s certainly making Cashman eat some crow this summer, isn’t he? Soriano, along with the returns of Curtis Granderson and Alex Rodriguez, and even the acquisition of Indians castoff Mark Reynolds, have completely revitalized this lineup. In turn, Robinson Canó is actually getting pitches to hit now, which has turned him back into one of the most dangerous hitters in the game. Before he got to the Bronx, Soriano was having the type of season one might expect from an aging power hitter. He was hitting .254 with 17 HR and 51 RBI in 93 games. Much like Cano through the first few months, Soriano was doing his hitting in a lineup that provided him with very little protection. However, his numbers aren’t that bad. His average is lower than it would have been in his prime, but he showed that he could still pop one over the fence every once in a while and was on pace for somewhere in between 25 and 30 homers and 80+ RBI. That’s not bad for a 38 year old in a lineup full of nobodies (sorry Anthony Rizzo). As of the time I am writing this, Soriano has played 43 games with the Yankees. In those 43 games, he’s hit .253. That’s about the same as before, right? That’s where the similarities between his time in Chicago and his time in New York end. 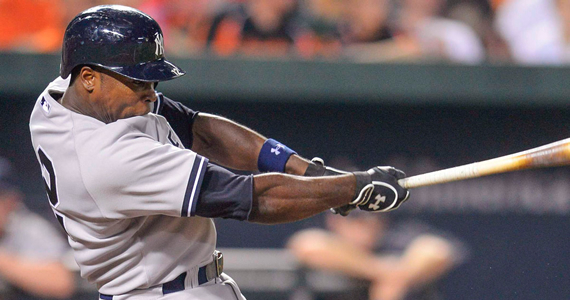 In those 43 games, Soriano has hit 15 HRs and driven in 47 runs. In less than half the games, he has pretty much equaled production. He’s also had four multi-home run games, compared to the three he had in Chicago. During a four-game stretch in mid-August he drove in a record-tying 18 runs (he won Player of the Week that week). If you stretch out his numbers over a full season (something that would basically be impossible for him to accomplish in real life), Soriano would be looking at a 56 HR, 177 RBI season. He’s not just hitting home runs either. He’s also stolen 7 bases, often in key situations when the Yankees have needed big runs (he’s also had a couple of bonehead caught stealings, but who is counting?). He’s also hitting when it matters most. I read a stat today that Sori was hitting .179 with no one on base, .350 with two outs and runners in scoring position (RISP) and .385 in “late and close” situations (thanks to ESPN New York for that stat). Girardi has nestled him behind Canó and in front of Mark Reynolds or Curtis Granderson, so Sori is getting tons of pitches to hit. He’s not letting too many of them get past him at this point. We can’t give him all the credit for the Yankees resurrection in the last couple of months, but he’s been huge. Here’s hoping he can keep it going a little further, and the Yankees can somehow sneak into that second Wild Card spot. They have some huge games coming up against the Orioles and Red Sox, so they’re going to need all hands on deck.